We have three cottages available. Each cottage has been recently renovated to a high standard to provide extremely comfortable and well-appointed accommodation with electric central heating. 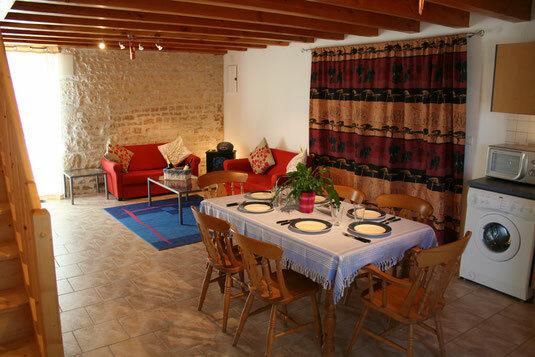 All our cottages are registered with and inspected by Charente Maritime Tourist Bureau and have all been awarded 3*. BAMBOU GROVE provides accommodation for four people and is situated in the main garden near the pool with its own terrace, garden with garden furniture, barbecue and private parking. The bedrooms are located on the first floor. The twin bedded room can accommodate an additional cot or futon for a third child. Bambou Garden and Bambou Grove can be joined together on the ground floor for a larger group by opening the fully insulated sliding door between the two cottages. When not in use the two cottages are totally independent and the key is held by the owner!! There are two double en-suite bedrooms (1 double, 1 twin) with Italian bathrooms, excellent mattresses, bedside lamps, clock radio and hair dryer. All cottages have a spacious open-plan living room which is furnished to a superior standard, consisting of sofas, chairs, dining area and fully equipped kitchen. Each cottage has its own private terrace, garden with garden furniture, barbecue facilities and private parking. We have tried to think of everything to make your stay special. To save on luggage space, we provide a luxury welcome pack and all cleaning materials and products. All linen, towels and central heating are provided within the prices. Travel cots with proper mattresses, high chairs and baby bath are also provided. Please request on Booking Form. Beach and jacuzzi towels are available to those arriving by air by arrangement. If there is anything we have forgotten or you would like, please ask. For prices please see our Tariffs page. If you are tired or want a break from the kitchen, you can dine with our other guests, provided you let us know by 10 o’clock that morning. Special dietary requirements can also be catered for. Our Menu Page gives you an idea of what might be available. The nearest restaurant is a delightful, family run auberge, in the hamlet of Coucoussac. Whilst the nearest bar, small restaurant and boulangerie are to be found in the village of Siecq, which is within walking distance. There is also a small bar, mini-supermarket, tabac and post office in both Ballans and Sonnac. All these facilities are about 2 kilometres away and within easy cycling distance! We are ideally located for touring or house hunting in the Cognac region. Our What to See and Do page provides an idea of what the area has to offer. Should you need help or advice on purchasing or renovating property, you only have to ask. We can also help with local artisans.